Monday 16th 42-60F, misty, heavy grey overcast but calm again. Another day without wind turbines? Where will it all end? It sounds as if the Gulf Stream is badly weakening. So will we have a New Ice Age here in newly chilly Europe? Can you even imagine the impact on everyday life? Down-filled, silk ties will become the new, standard, business wear. We will all have to drink government-subsidized vodka before setting off to work, just to get warm. Hypothermic, old people will be propped up by the dustbins on Thursdays. To be taken away by a new fleet of black recycling lorries with curtained side windows. Nothing will grow in the fields and they will turn to sprawling forests full of chainsawing lumberjacks making [wet] firewood. Wolves and bears will forage beside hungry humans outside McSlobs soup kitchens. Two wheel drive will become compulsory on delta pedal tricycles. I was able to get nearer the Nuthatch today. It was perched at a deep hole in a tree trunk. Through my binoculars it was clearly a Nuthatch in every respect. The light breeze was slightly cool on my hands but I was soon comfortable apart from the Ecco right boot. Which continues to nag at my ankle. I set off north after morning coffee with a light tailwind. It allowed me to cruise at 18-20mph and even 15mph on a long uphill drag. A black BMW went past at about 100mph after overtaking a whole chain of cars, on a blind hump, just before a village. Returned heavily laden at half my outgoing speed. Only 14 miles. 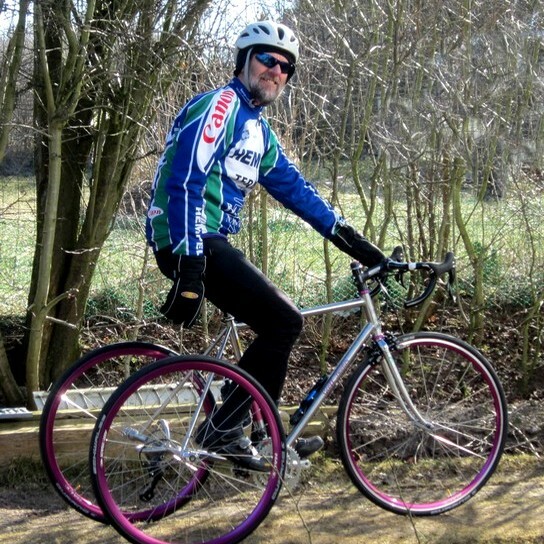 The Vetta saddle allows me to lie low over the handlebars which the Brooks did not. I had to stop and adjust the tilt slightly as I was sliding forwards after swapping back to the Vetta. I could really do with a micro-adjusting pillar. Tuesday 17th 43-60F, 6-15C, grey and very misty with some sunshine promised for later. The Danish police have announced they are to have a blitz on speeding with their camera vans. They could easily repay the national debt of several European countries inside a week, from a single camera. But this is considered to be against the basic human rights of the criminally insane. So they advertise in the press so the criminally insane can pause briefly in their normal behaviour before flooring it as soon as the "danger" is passed. I read somewhere that the Danes' speeding as the only known example of belligerence in their otherwise placid acceptance of all their <cough> leaders throw at them. Or rather take away from them in endless taxes on taxes on taxes. The Danes are not normally given to shows of independent thought or action. Except behind the wheel when their true characters can really come out. Like the nut job who tried to run me down on the cycle path because I carefully adjusted his wing mirror when he was completely blocking the cycle path to my trike's further progress. He had stopped for a chat with the owner of a roadside house. Unlike terrorism, mass or serial murder and child molesting, adjusting wing mirrors is a capital offense in Denmark [apparently.] But that's psychopaths for you. They always claim the victim was the reason for their serial, murderous behaviour. "He/she made me do it!" They scream hoarsely in their defense. When there is none. Had I shown a video on YouTube of the psychopath deliberately trying to kill me, as an elderly tricyclist on the kerb-protected cycle path, it is I who would have been prosecuted. NOT the murderous, raving nut job behind the wheel. Who would cheerfully have been awarded damages for my intrusion into his private life. While the cell door slammed shut on yours truly.Who else do we know who blames the victim? Oh, yes, that's right. Very few birds on my walk today. The traffic was quite light, but of the couple of dozen vehicles I saw, not one had a rear fog light lit. Several had no lights showing at all despite it being compulsory to show dipped headlights 24x7 in Denmark. Several were driving on side lights. Vehicles were completely invisible at 200 yards and only soft silhouettes at 100 yards. The mist was visible as small clouds moving slowly across the landscape within only a few yards of me, against the dark soil. Too busy, in a parallel universe, for a ride.